All the greatest thrills require all out commitment. 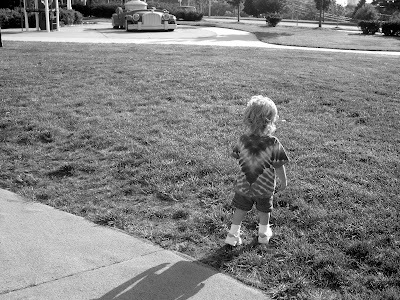 Our thrills for committing started when we were 10 months old. We let go of the table and walked. Moved all on our own. Freedom. Independence. A brand view of the world. We became walkers by committing 100%. Letting go and going for it. I remember being in school. The coolest activity on the playground was swinging. Swings weren't the greatest because of the pendulum like motion in which they traveled. Actually, that was the boring, tedious part needed to get to the fun part. They were the coolest because of the jump. That's where it was at. You pumped as hard as you could. Got as high as you could. Brought your elbows in front of the chains... AND JUMPED. Superman, for a split second. 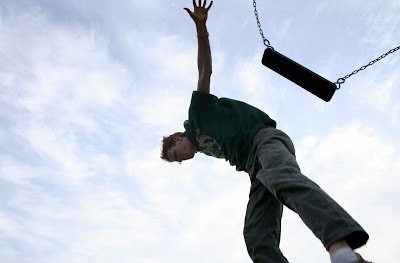 Jumping off the swing is not only thrilling it also immediately solidified your social standing. Why? Not everyone would make the jump. Far too many peers the fear of letting go of the chains and committing to flight kept swinging back and forth. Not getting anywhere. Childhood isn't the only season in life that offers these examples. Roller coasters, bungee jumping, and skydiving are all described as a few of the most the thrilling and exhilarating experiences in life. Strapping in, taking the leaping, and leaving the plane are necessary step to reap the reward. Those that do take the plunge, LOVE IT. They rave about it. They recruit others to join. They've experienced the tremendous high that comes with committing to an activity 100%. Health is no different. Commit to exercising and eating a healthy diet you WILL reap the rewards. Enjoy a better quality of life! Don't delay. Commit today. Go all-in on your health. Experience the thrill. Life will never be the same. Don't know what to do or where to start your health journey? 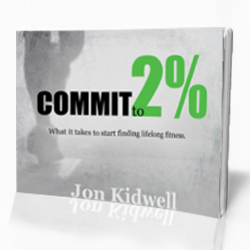 Download my e-book, Commit to 2%, by clicking here. What other thrilling activities require 100% commitment?